Postknight is a brilliant bite-sized action RPG that revolves around the adventures of a courageous knight who has one more responsibility besides battling monsters and completing quests – delivering letters to people. And while this sounds pretty boring, it actually allows him to meet new people, know their background and help them out. Your character will also stumble upon pretty girls who love gifts. Giving a gift ensures a return gift, which may contain materials coins and other things that may help your character in one way or the other. The game’s battle system lets players tap the “Charge”, “Shield” and “Potion” buttons to attack enemies, defend against ranged attacks and heal your character. There’s no strategy involved, but timed attacks by tapping the charge button at the right time lets you eliminate enemies before they attack your character. You will also have to keep an eye on your character’s HP and tap the potion before it hits 0. Follow our beginner-level guide if you want to make your Postknight stronger, get more rewards and deal more damage to enemies without his reducing HP. Battle enemies to earn experience points. The EXP received after killing an enemy increases your character’s level meter. Once the meter is full, your character levels up and you receive points that can be allocated to his attributes, which will make your character stronger. Just like any RPG, this game has 4 main character attributes: Strength (STR), Agility (AGI), Intelligence (INT) and Vitality (VIT). Allocating points to strength increases physical damage. Allocating points to Agility increases critical and dodge rate. Increasing INT stats boosts magical defense and experience points gain. Boosting vitality increases your character’s health cap. Upgrade your equipment before every quest, but make sure you have the required materials. Blacksmith Aden can help you upgrade your shield and weapons with materials that you receive from loot chests. Enemies may also drop materials after being defeated. Upgrading armor increases defense against enemies. Collect items such as weapons, shields, armor and helmets to complete a set and get bonuses. For example: Collecting Novice’s Sword, Buckler, Garb and Helmet will complete the “Novice’s” set and you will get 10 percent extra gold. You can get equipment from loot chests at the end a quest. To get a list of equipment sets, tap the blacksmith. There you will find how many items you have collected so far and what’s remaining to complete a set. Finish all Tier 1 sets to unlock Tier 2 sets. The next tier contains better equipment and amazing bonuses. Complete delivery quests before accepting tougher tasks. Delivery quests are pretty easy to complete plus there are some cool materials and rewards you can collect on your way to completing a quest. You unlock these special mini-quests after your character is knighted. You will have to tap the flag icon to get a list of delivery quests. For completing such quests, you not only get loots chests but also tokens that can be used to rank up your character. The higher his rank, the better rewards he will get. It boosts your gold earnings, EXP and others. With a higher rank, the time required to reload a list of delivery quests will be lesser than before. You get potions from Alchemist Fiora. You can infuse a potion with various herbs to make it more effective. Collect special herbs from enemies and loot chests. Different types of herbs are required to upgrade 3 unique attributes of a potion. For example: Using Ceruleaf for the red potion will allow it to heal more HP, but then it will reduce cooldown time. Using Puffwort will decrease the red potion’s cooldown time. The third attribute is actually a bonus trait that varies from potion to potion. In case of red potion, it increases defense if you use Sage. Don’t start the next quest immediately after battle. Give your character some rest for a few seconds. A brief period of rest will refill his HP quickly. Once it’s full, you are ready for the next delivery quest. Don’t close the app as HP refilling stops after closing the game. On your way to the next stage, it’s all about how quickly you tap the charge, shield and potion to stay alive in battle. You will face various types of enemies – some will try to attack from a close range whereas others will attack you from a distance. You will have to fend off attacks, keep your HP above dangerous levels by tapping the potion, defend your character from incoming arrows/projectiles and at the same time eliminate them. Tapping the charge button will let your character charge at his enemies with full force, reducing their HP considerably. When charging, your character does not get knocked back but will still take damage. At level 10, you will unlock the “Assault Boost”. This passive skill ensures that your enemies receive additional damage. Moreover, the damage is doubled if the enemy is stunned. If your character has a high STR it will deal more physical damage to enemies when you tap the charge button. Tap the shield button after spotting an incoming projectile. Your character will be knocked back slightly when a projectile hits the shield. He will receive reduced damage as long as his shield is active. It stays active for a few seconds so make sure you tap it when you see an incoming projectile. Now let your character move closer to a ranged unit. 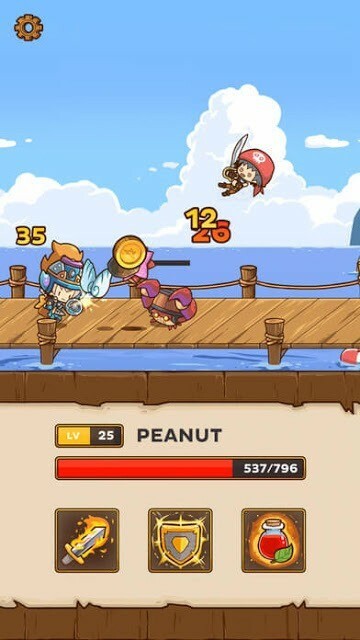 Tap the charge button to deal max damage to him. In a nutshell, tap the shield icon first to take less damage and then press the charge button when your character gets closer to enemy. This strategy can be useful in boss rounds where the solo enemy attacks from a distance. Enemies that attack from close range approach pretty quickly, so you may not be able to attack them when the first batch approaches your character. After being knocked back, quickly press the attack button to charge. By that time more enemies will try to get close to your character, but since you pressed the charge button, you character will also rush towards them and deal damage. With a high STR, upgraded weapons, the charged attack can be quite deadly, taking down more than one enemy at a time. Postknight has a cute little dating system that lets you gift flowers, treats and other goodies to girls and win their hearts. You will receive a gift for every gift you give. Once you gift someone you like, you will have to wait until the cooldown time ends. You can gift things she likes to get better gifts, which could include materials, coins and other goodies. However, keep in mind that ignoring a girl by not giving any gift can break her heart, so make sure you send a gift soon after the cooldown time ends. Every girl wants a special gift. For example: Magnolia wants honey and spring blooms, curry rice, leaf handkerchiefs, apple juice etc. You can buy these gifts using event tokens and coins. You can get them from “Merchant Leila”.